Description: Redaction criticism attempts to identify biblical authors' theological interests by examining their adaptation of sources. Focusing on representative studies of Jesus' disciples in the Gospel of Mark, this pioneering book by C. Clifton Black has become the standard evaluation of that method's exegetical reliability. Comprehensively reviewing recent scholarship, Black identifies three distinctive types of redaction criticism in Markan interpretation. He demonstrates that diverse redaction-critical interpretations of the disciples in Mark have bolstered rather than controlled scholarly presuppositions to a degree that impugns the method's reliability for interpreting Mark. The book concludes by assessing redaction criticism's usefulness and offering a more balanced approach to Mark's interpretation. This second edition includes a substantial, detailed afterword that revisits the book's primary issues, converses with its critics, and provides an update of Markan scholarship over the past twenty-five years. 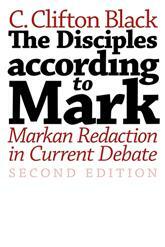 Citation: Michael Kok, review of C. Clifton Black, The Disciples According to Mark: Markan Redaction in Current Debate, Second Edition, Review of Biblical Literature [http://www.bookreviews.org] (2014).